10 February 2010 4:32 p.m.
Astronautsaboard the spaceshuttle Endeavour woke up to some good news Wednesday, when they learnedthey won?t have to perform an extra scan of their spacecraft?s heat shieldwhile docked at the station. Mission Control roused the astronauts at 4:19 a.m.EST (2119 GMT) with Richard Strauss? ?Also Sprach Zarathustra,? also known asthe symphonic theme to the science fiction film ?2001,? and relayed the news. Shuttle astronautNick Patrick thanked Mission Control for the update and the music, which wasselected for him by his family. ?It reminds of a childhood spentdreaming of flying in space,? said Patrick, who is making his secondspaceflight. Today is Flight Day 4 ofEndeavour?s 13-day mission to the International Space Station. 10 February 2010 3:12 a.m.
With broadsmiles and hearty hugs, the six Endeavour astronauts received a warm welcome asthey entered the International Space Station just after 2:16 a.m. EST (0716GMT). The two crews joined into one as the station flew 216 miles above thecoast of western Australia. The twovehicles docked about two hours earlier. "We'rehappy to see our friends," station commander Jeffrey Williams told hisguests after they floated aboard. "Some of us are really happy because wehaven't seen many people other than the crew for a long time." The stationis currently home to two American astronauts, two Russian cosmonauts and aJapanese astronaut. The station astronauts said they had made a special"Welcome" sign for their guests and greeted them with hearty laughs,at times saying "Welcome aboard!" and "It's good to seeyou!" "We areglad to be here, it was absolutely beautiful coming on up," Zamka saidafter boarding the station. "As we were looking out the window we justcouldn't believe how spectacular and shiny the space station was. After awhileI just quit looking at it because I kind of didn't to think about docking atthis big, beautiful station." Clickhere for a look at SPACE.com?s docking wrap story. 10 February 2010 1:01 a.m.
After aslight delay to wait out some slight oscillations between Endeavour and thespace station due to their relative motions, the two spacecraft have driven thehooks and latches to set up a secure connection after today?sdocking at12:06 a.m. EST (0506 GMT). Hatchesbetween the two spacecraft are due to open at around 2:04 a.m. EST (0704 GMT),when the six Endeavour astronauts will float inside the station to meet thefive men inside. Spaceshuttle Endeavour has officially docked at the International Space Station todeliver NASA?s last big room and window-lined dome to the orbiting laboratory.Docking occurred at 12:06 a.m. EST (0506 GMT) as both spacecraft flew 215 milesabove the Atlantic Ocean, just west of Portugal. ?Station andHouston, capture confirmed,? shuttle commander George Zamka called out as thetwo spacecraft linked up. Clickhere to see SPACE.com?s predocking story. MissionControl has given the shuttle Endeavour the go ahead for docking with the InternationalSpace Station. Docking is on track for 12:06 a.m. EST (0506 GMT). Endeavourhas now completed its short, 9-minute back flip while astronauts on theInternational Space Station snapped photos. Shuttle Commander George Zamka willnow fly the shuttle up in front of the station, then back it into a docking protat the end of the outpost?s Harmony connecting node. Docking ison track for 12:06 a.m. EST (0506 GMT). MissionControl has given Endeavour commander George Zamka the go ahead to perform anorbital back flip with the shuttle to expose its tile-covered belly to theInternational Space Station so astronauts can photograph its heat shield. Theimages will be relayed to Earth for analysis. With dockingnow just over an hour away, cameras on the shuttle Endeavour and InternationalSpace Station are beaming video images of each down to Earth. The twospacecraft are 2,000 feet away from one another and closing. The sixastronauts aboard shuttle Endeavour have called the International Space Stationfor the first time and are now two hours away from dockingat the orbiting lab. Mission specialist Kay Hire radioed the station to sayhello and ask if the outpost could hear her. ?We have youloud and clear. We had tally ho a little while and you?re looking pretty goodback there,? shuttle commander Jeffrey Williams told the Endeavour crew. ?We have youloud and clear as well, and we?ll be there soon,? Hire said. ?We?ve gotthe place ready for you,? Williams replied. ?Looking forward to welcoming youonboard.? Space shuttle Endeavour has firedits twin orbital maneuvering system engines to close the distance between itand the International Space Station, where the shuttlewill dock at 12:06 a.m. EST (0506 GMT). ?Good burn, Endeavour,? Mission Control radioed the shuttle. ?Endeavour copies, good burn,?replied shuttle commander George Zamka, who is at the helm. The six astronauts aboard shuttle Endeavourare awake for their third day in space, one aimed at docking at theInternational Space Station at 12:06 a.m. EST (0506 GMT) on early Wednesday. ?It?s a beautiful day up here onEndeavour, thanks so much for that great song,? Zamka said after MissionControl roused the astronauts at 5:14 p.m. EST (2114 GMT) with the song?Katmandu? by Bob Seger. Today is Flight Day 3 of Endeavour?s13-day mission to deliver a new room and observation deck to the InternationalSpace Station. The six astronauts aboard the spaceshuttle Endeavour were awoken at around 6:15 p.m. EST to the tunes of ?Give MeYour Eyes,? by Brandon Heath, a song played especially for pilot Terry Virts,the crew?s only first time spaceflyer. ?What a great song by Brandon Heathas I was looking out the window at the ocean down below, and the beautifulEarth below,? Virts said. The astronauts plan to spend the dayscanning their shuttle?s heat shield for any signs of possible damage incurredduring Monday morning?s launch. NASA is broadcastingEndeavour?s STS-130 mission to the International Space Station on NASA TV.Click herefor SPACE.com's NASA TVfeed or follow the NASA TV link at the upper left ofthis page. CAPE CANAVERAL, Fla. ? 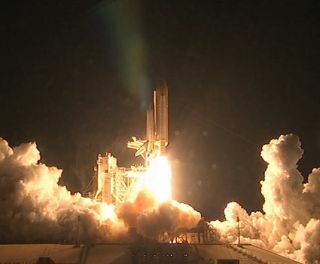 The STS-126astronauts aboard the space shuttle Endeavour have discarded the 15-storyexternal tank that fed the orbiter?s nearly nine-minute launch into space. With the tank jettisoned, Endeavouris now in orbit. A flash camera will photograph the tank?s departure to recordany foam insulation loss. Analysts at Mission Control inHouston?s Johnson Space Center will search for any signs of foam loss duringlaunch, and its potential as a debris hazard to Endeavour?s heat shield. CAPE CANAVERAL, Fla. ? The fiveengines boosting Endeavour and its external tank towards orbit have shut downas planned about eight and a half minutes into flight. The milestone, known as Main EngineCut Off (MECO) The spacecraft is flying towards its intended orbit, with thenext major task aimed at discarding the shuttle?s external tank. NASA is broadcasting Endeavour?sSTS-130 mission to the International Space Station on NASA TV. Click herefor SPACE.com's NASA TVfeed or follow the NASA TV link at the upper left ofthis page. CAPE CANAVERAL, Fla. ? The twinsolid rocket boosters assisting Endeavour?s launch into space have separated asplanned from the shuttle?s external tank. The reusable boosters separate abouttwo minutes and five seconds after liftoff and fall back toward the AtlanticOcean, where they will land under parachutes and be retrieved by recoveryships. They are equipped with cameras to record the performance of Endeavour?sexternal tank and any foam loss seen during today?s ascent. CAPE CANAVERAL, Fla. ? The spaceshuttle Endeavour has cleared the launch tower and gaining altitude afterlifting off at about 4:39 p.m. EST (0939 GMT). Riding spaceward aboard Endeavourare STS-130 commander George Zamka, shuttle pilot Terry Virts and missionspecialists Robert Behnken, Kathryn Hire, Nick Patrick and Stephen Robinson. Itshould take Endeavour about eight and one-half minutes to ferry itsseven-astronaut crew into orbit. NASA is broadcastingEndeavour?s STS-130 mission to the International Space Station on NASA TV.Click herefor SPACE.com's NASA TV feedor follow the NASA TV link at the upper left of this page. CAPE CANAVERAL, Fla. ? ShuttleEndeavour has been cleared for launch from Kennedy Space Center's pad 39-A onits 24th mission - the 130th space shuttle flight and the 32ndshuttle mission to the International Space Station. Thecountdown has just picked up following the planned T-9 minute hold as finallaunch preparations are rushed to completion. Endeavour's preferred launch timehas been slightly adjusted to 4:14:07 a.m. EST (0914:07 GMT) ? near themidpoint of a 10-minute launch window. A secondary launch window pane thatwould result in a Flight Day 4 rendezvous closes at 4:21:39 a.m. EST (0921:39GMT). The missionmanagement team has been polled and all have reported 'Go for launch.' The sixSTS-130 astronauts, led by mission commander George Zamka and pilot Terry Virts,are strapped into their seats, running through their pre-launch checklists andare closely monitoring spacecraft systems for their ascent to orbit. No technicalor vehicle issues are being worked at this time, with very little chatter onthe internal communication loops. Weather at the launch site isobserved 'Green' or 'Go' on all fronts with no constraints to launch.Conditions at the Trans-Oceanic Abort Landing (TAL) site in Zaragoza, Spain isalso 'Go' to support a launch. The EasternRange is reporting 'Clear for launch.' The two Solid Rocket Booster recoveryships are on-station, about 140 miles northeast of Cape Canaveral, off thecoast of Jacksonville and about 7 miles away from the predicted impact point ofthe spent boosters. Over thenext nine minutes, the Orbiter's access arm will be retracted, the hydraulicpower system (APU) started, the liquid hydrogen and oxygen tanks pressurized,Endeavour' internal flight computers will take control of the countdown and abooster steering test will be conducted. The three space shuttle main engineswill ignite at T-minus 6.6 seconds and the twin solid rockets boosters willlight at T-minus zero resulting in liftoff. Allspacecraft systems are reported 'Go'. 9 minutes to launch. NASAwill broadcast Endeavour's STS-130 mission to the International Space Stationlive on NASA TV during launch and the flight. You are invited to follow themission using SPACE.com?s NASA TV feed, which is available by clickinghere or using the button at the upper lefton this page. CAPECANAVERAL, Fla. ? Breaks in a low cloud ceiling over Florida's Kennedy SpaceCenter look "promising," according to launch weather officer KathyWinters, and conditions are currently forecast and observed 'Green' or 'Go' forshuttle Endeavour's pre-dawn launch to the International Space Station. Endeavour's preferred launch timehas been adjusted slightly to 4:14:07 a.m. EST (0914:07 GMT) ? near themidpoint of a 10-minute launch window. Meteorologists are also closelymonitoring weather conditions at the Trans-Oceanic Abort Landing (TAL) sites inSpain and France. At least one TAL site must be available to support a launchattempt; two of the three TAL sites in Spain are currently 'No Go' for weather. Asthe countdown enters its final 20 minutes, all is in readiness ? weatherpermitting - for Endeavour's launch from pad 39-A on its 24th mission. Theshuttle's hatch has been closed and latched for flight, the six STS-130astronauts are strapped into their seats, reviewing their pre-launch checklistsand closely monitoring their spacecraft systems in preparation for their ascentto orbit. CAPECANAVERAL, Fla. ? The space shuttle's hatch has been closed and latched forflight, the six STS-130 astronauts are strapped into their seats, but a lowceiling of clouds could again spoil Endeavour's pre-dawn launch attempt to theInternational Space Station. Meteorologistsare closely monitoring a low deck of clouds moving-in off the Atlantic. Launchofficials are hopeful that some scattering and breaks in the cloud ceiling overthe Kennedy Space Center will develop in time to meet launch and abortvisibility requirements. As the countdown enters its final60 minutes, the launch team is not currently working any technical issues ?other than the weather. The countdown clock is currently halted at the T-minus9-minute mark ? a scheduled built-in hold lasting approx. 45 minutes. Theastronauts are running through their pre-launch checklists and are closelymonitoring their spacecraft systems in preparation for their ascent to orbit.The close-out crew has finished breaking down the 'White Room' access platformsurrounding the Orbiter's hatch and departed the launch pad. CAPECANAVERAL, Fla. ? Shuttle Endeavour's hatch has been closed and latched forflight, the six STS-130 astronauts are strapped into their seats and finalpreparations are progressing smoothly for tonight's launch attempt from pad39-A at Florida's Kennedy Space Center. Launch isscheduled for 4:14:08 a.m. EST (0914:08 GMT) ? the midpoint of a 10-minutelaunch window. A final adjustment may be made at the T-9 minute hold to moreprecisely align with the orbit of the International Space Station. The STS-130crew - led by veteran commander George Zamka and rookie pilot Terry Virts ?just completed the final series of air-to-ground communications checks toensure that the astronauts can talk to flight controllers and each other duringthe spacecraft's ascent to orbit. The launch team is not workingany technical issues at this time. The official weather forecast is anoptimistic 60 percent probability of acceptable conditions ? low cloudsblowing-in from the Atlantic are expected to scatter sufficiently to meetlaunch and abort visibility constraints. STS-130 willbe the 32nd shuttle mission to the International Space Station and the 13-dayflight will include three spacewalks by mission specialists Bob Behnken andNicholas Patrick. CAPECANAVERAL, Fla. - The six STS-130 astronauts are now securely strapped intotheir seats onboard shuttle Endeavour and are beginning final preparations fortonight's launch attempt from Kennedy Space Center's Pad 39-A..
Endeavour's middle-of-the-nightlaunch is scheduled for 4:14:08 a.m. EST (0914:08 GMT) ? the midpoint of a10-minute launch window. Led by veteran commander George Zamka(making his second spaceflight) and rookie pilot Terry Virts, the STS-130mission specialists, all spaceflight veterans, are Kay Hire, Steve Robinson(who will serve as Endeavour's flight engineer), Nicholas Patrick and Bob Behnken. Theastronauts are now engaged in a series of communications checks between thespacecraft, the launch team and Mission Control in Houston. CAPE CANAVERAL, Fla. ? NASAmission commander George Zamka has climbed onboard shuttle Endeavour for itssecond middle-of-the-night launch attempt at 4:14:08 a.m. EST (0914:08 GMT).STS-130 will be Zamka's second spaceflight. You can watch the action liveon NASA TV. No technicalissues are currently being worked and the official weather forecast is peggedat a 60 percent probability of acceptable conditions for launch. Weatherconditions are similar to last evening; however, forecasters are much moreconfident that any low clouds blowing-in from the Atlantic will scattersufficiently to meet launch and abort visibility constraints. Clickhere to see SPACE.com?s prelaunch story for today?s second launch tryfor Endeavour. At thistime, shuttle Endeavour is fully fueled for launch and the vehicle is in"stable replenish" mode, with propellants being topped-off untillaunch time. Last evening, technicians loaded Endeavour's 15-story external fueltank with the super-chilled liquid hydrogen and liquid oxygen that will feedits three main engines during the 8.5-minute ascent into space. Fuelingoperations ended at 9:54 p.m. EST Sunday with more than 500,000 gallons ofcryogenic propellant loaded into the fuel tank. CAPECANAVERAL, Fla. ? The crew of space shuttle Endeavour, clad in their brightorange launch-and-entry pressure suits, has departed the Operations &Checkout (O&C) Building at the Kennedy Space Center. The six astronauts,riding in their silver 'Astro Van', are now en route to the seaside pad 39Awhere the shuttle is poised for launch, brilliantly illuminated by the xenonfloodlights eerily slicing through the night sky. You can watch the action liveon NASA TV. After a25-minute ride to the launch pad, the STS-130 astronauts will enter Endeavourone by one, beginning with veteran shuttle commander George Zamka, to preparefor tonight's launch attempt. Endeavour's middle-of-the-nightlaunch is scheduled for 4:14:08 a.m. EST (0914:08 GMT). No technicalissues are currently being worked. The official weather forecast is anoptimistic 60% chance of acceptable conditions for launch ? the potential for alow cloud deck at about 4,000 feet coming in off the Atlantic remains aconcern. CAPE CANAVERAL, Fla. ?Endeavour?ssix-astronaut crew is suiting up for NASA?s planned predawn launch Monday at4:14 a.m. EST (0914 GMT). The astronauts are due to head to the launch pad atabout 12:24 a.m. EST (0524 GMT). You can watch the action liveon NASA TV. Currently, weather is good forthe planned launch attempt, though NASA is watching for a low-lying clouds,which scrubbed Endeavour?s first launch attempt on Sunday. CAPE CANAVERAL, Fla. ?Spaceshuttle Endeavour is on track for its planned predawn launch at 4:14 a.m. EST(0914 GMT). You can watch the action liveon NASA TV. Endeavour has a 60 percent chanceof good weather for today?s launch attempt. The potential for low, thick cloudsposes the only threat. CAPE CANAVERAL, Fla. ? Fueling ofspace shuttle Endeavour has been completed, with NASA topping of thespacecraft?s external tank at 9:54 p.m. EST (0254 GMT). You can watch theaction liveon NASA TV. The shuttle is on track for aplanned 4:14 a.m. EST (0914 GMT), with weather conditions currently ?go? forliftoff. CAPE CANAVERAL, Fla. ? NASA iskeeping a close eye on cloud conditions for Monday?s planned predawn launch ofthe space shuttle Endeavour. You can watch the action liveon NASA TV. Currently conditions are notacceptable for launch due to a too-low cloud layer, though NASA expects thecloud layer to go back and forth between ?go? and ?no-go? got launch. Thefueling operations for the 4:14 a.m. EST (0914 GMT) launch is about two-thirdscomplete. CAPE CANAVERAL, Fla. ? NASA hasbegun fueling the space shuttle Endeavour for its Monday launch attempt, withliftoff set for 4:14 a.m. EST (0914 GMT). You can watch the action liveon NASA TV. Fueling operations began at 6:50p.m. EST (2350 GMT) to fill Endeavour?s 15-story external tank with the 526,000gallons of super-cold liquid hydrogen and liquid oxygen that will feed theshuttle?s main engines during the 8.5-minute ride into space. The fueling process is expectedto take about three hours. CAPE CANAVERAL, Fla. - A lowcloud ceiling over Florida's Kennedy Space Center did not dissipate in time,forcing a scrub of tonight's planned launch of space shuttle Endeavour. NASA will likely try again tolaunch Endeavour in the pre-dawn hours of Monday morning. CAPECANAVERAL, Fla. ? The space shuttle?s hatch has been closed and latched forflight, the six STS-130 astronauts are strapped into their seats, but a lowceiling of broken clouds could spoil Endeavour?s pre-dawn launch attempt to theInternational Space Station. Weatherconditions are currently 'Red' or 'No Go' for low clouds and theonce-optimistic weather forecast has been downgraded to only a 30 percentchance of acceptable conditions for launch. Launch remains scheduled for4:39:50 a.m. EST (0939:50 GMT) ? near the midpoint of a 10-minute launchwindow. As the countdown enters its final60 minutes, the launch team is not currently working any technical issues. Thecountdown clock is ticking down toward the T-minus 9-minute hold ? a scheduledbuilt-in hold lasting approx. 45 minutes. CAPECANAVERAL, Fla. ? The weather forecast has taken a turn for the worst fortonight's launch attempt of shuttle Endeavour on a mission to the InternationalSpace Station. Winds remaingusty and a broken cloud ceiling that could violate visibility constraints haveresulted in the launch weather forecast being downgraded to only a 30 percentprobability of acceptable conditions for launch. Launchremains scheduled for 4:39:50 a.m. EST (0939:50 GMT) ? the midpoint of a10-minute launch window. A final adjustment may be made at the T-9 minute holdto more precisely align with the orbit of the International Space Station.